Avoid one word filenames. In other words DO NOT string multiple words together to create a singular filename. 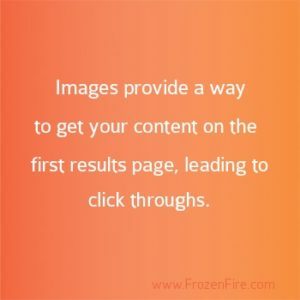 Make sure you give the image a name that is related to the content that image will be supporting or a name that is a brief description of the image. For Example, if you’ve written a blog entry about a princess-themed birthday cake a good name for an image you would add to this blog would be, “princess-birthday-cake”. Include keywords in your image names so search engines pull your images up when people search those words. When search engines pull up the results, only the first 150 characters are visible in the result preview; so limit the text to 150 characters or less to avoid being cut off. Use a description that is relevant to the content that the image will be supporting. Always use the alt attribute for images that you want indexed in search engines (images used in the website’s background or banners can be ignored). While filenames and alt tags are two of the more important aspects of image optimization there are several other factors to pay attention to when adding images to your website for search engine optimization. Headings and Bold Text: If image optimization for a particular image is important, you can optimize the image by bolding the filename or giving the image a heading tag of the term you want to focus on. Image Captions: Image captions are another way to give search engines a nudge in the direction you want them to go. You can place the search term or keyword you are trying to optimize for at the front of the caption so that it’s the first thing the search engine sees. Image Size: If you keep your images a reasonable size, they generally perform better in regards to image optimization. A general sizing rule you can use is to make sure your images are larger than 100×100 but smaller than 1200×1200. Using a thumbnail that links to a larger picture is also helpful. Image optimization is only a small piece of the big picture when it comes to full website search engine optimization, and it is most effective when done by a professional. If you are interested in learning more about search engine optimization contact an expert at Frozen Fire.